One of my goals to reach this week is to do more exercise. Does it count if I’ve been running, well not literally running, but walked different places in the city? After work, where was quite busy day, I needed to go to the about 5 stores today and I was home just before six. I was so hungry and so tired that I just couldn’t go to walk. Well tomorrow I’ll go to my friends cottage for two nights and there’s lot to do after winter. But back to today. So I decided to make dinner to myself. I was just bought some chicken breasts and vegetables. I seasoned chicken breasts with Santa Maria’s Mango Curry, pepper and vegetable oil. I pre-heated the oven to 200°C (392°F) and roasted them about 30 minutes. I also made huge salad me to eat right today and for tomorrows lunch to work. I put there two different kind of lettuce, some cucumber (surprise, surprise! 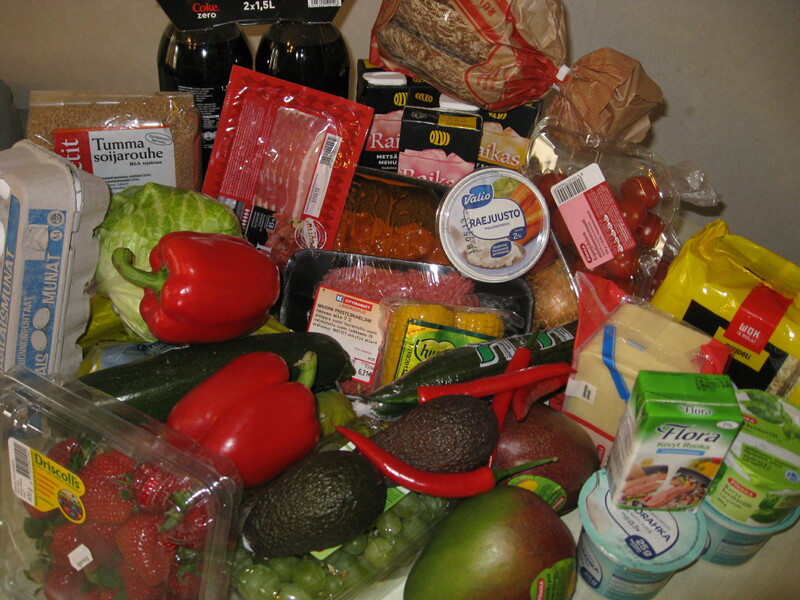 ), some bell pepper, two spring onions, some green grapes and three peaches. I just joined a month ago to Tehy. It’s union of Health and Social Care Professionals and I got gift card in a bookstore for joining. That was just perfect because I’ve been planning to by a cookbook about healthy foods. Today I bought two, or one was kind of free because of the gift card. Terveellistä ruokaa vartissa by Pirjo Saarnia is oblivious in Finnish and its translates: Healthy food in 15 minutes. There’s two parts in the book. The first part is about food: which food is healthy, why it’s healthy, why food is important at all. The second part is about recipes and suggestions what people should have in they pantry, refrigeration or freezer. I’ve read one of her books last fall concerning about nutrition. I liked her writing style and she had good everyday examples in there. The other book is Gordon Ramsay’s Healthy Appetite which contain recipes from breakfast to dessert. Some of the recipes looks quite simple and some of them aren’t but I attempt to try most of them. Have to go to bed now because I have to get up in six hours. Good night, don’t let the bed bugs bite. Hmm…? What to eat in the next week? It’s Friday. Yay!! And I have the weekend off. Tomorrow is my godsons 7th birthday party at noon and the evening we’ll go to eat quite fancy (or at least quite expensive) place with my friends. After dinner we have plan to have couple of drinks and go to clubbing. Just going to have fun. I’m on a mission to get thinner but due to my plans for the weekend it’s probably not going so well. But it’s just one day. I thinks it’s good to have day every now and then, when it’s allowed to eat and drink anything you want. Though it’s not so good idea so early on my mission ;). Oh well, it’s going to happen =). Next week I’ll eat much more healthier than during this week. I went to grocery store today and bought lot of food for the next week. I usually know what I’m going to do for lunches/dinners before I go to store, but today I didn’t. So I just bought lot of stuff that I could think to be used. Now I just have to figure it out what I’m going to made. There is potatoes, bell peppers, red peppers (chilies), avocados, mangoes, grapes. Strawberries are just for replace candy and yes, I did not buy any candy at all! Also I bought cheese, noodles, juice, eggs, corn, rye bread/buns, cottage cheese, plum tomatoes, zucchini, cream and sour cream. Cucumber is one vegetable I can NOT live without. I usually eat about 4 cucumbers per week. Today I just bought one, because I just got two from farmers market, where I usually buy as many vegetables I can/they sell. And yes, I’m not a vegetarian, not by far. I bought minced beef, bacon and pork stakes. I usually buy my meets without marinate, but today those marinated ones was on sale, so now I have six stakes in marinate in my home. I also bought texture soy protein to add with minced meat. Quark I usually eat at work with sugar free berry soup. And top of all, Coca-cola. Coca-cola zero! The one drink I can not live without. I don’t drink coffee or tea. I drink coke. I know it’s not good for my teeth. Actually I don’t think there is anything good in the coke, but I’m addicted to it. What do you think of my groceries? What should or shouldn’t I bought? This new life is great. I love it. My plan for today was wake up early, eat good breakfast and do some exercise. After I got home I ate spaghetti with minced meat sauce. I think it was quite healthy though spaghetti wasn’t whole wheat. Sauce was healthy ‘cos besides minced meat there was carrots, onions and parsnips. Before bedtime I ate two sandwiches again. I know that I should eat regularly while losing weight. In fact everybody should eat regularly to gain or to remain their ideal weight. I also know you should eat about 4 to 5 times a day. You should have a good breakfast, ‘cos it’s most important meal in day. I’ve read at breakfast should contain good amount of protein ‘cos it adds basal metabolism. It’s important increase your basal metabolism while you’re losing weight. Now I’m just writing about theory. I could do one or two posts just about theory regarding healthy eating and living. You shouldn’t forgot eat lunch, some healthy snack, dinner and healthy evening snack. I promise I would do something about my eating habits. This was just day 1. And I’m so excited about this blog. I thought about this blog while swimming. I noticed swimming is also good for your mind. ‘cos you have time to think everything while you just swim. I came up with loads of ideas to put in here. So I think I keep writing. This is fun. Though, I’m little bummed out ‘cos I can’t use this wordpress as good as I’d wanted to. But I’m learning. So bear with me. I’m off to bed now. Trying to write less confusing text tomorrow.